Do you like to bake with wholesome products? I love using stable flour blends, and blends that are whole grain and healthy for my family. We’ve been using RYZE Gluten-Free Flour recently and love the flavors and textures that RYZE adds to recipes. We’ve found it to be a 1-to-1 in a lot of our regular recipes. Like this Gluten-Free Pumpkin Bread for example. If you start with a good flour blend and you add in healthy ingredients like pumpkin and spices you’ll end up with an amazing and healthy baked treat. Do I have to use RYZE flour in this recipe? No. I’ve used other blends like Bob’s Red Mill 1-to-1 gluten free flour blend in this recipe. It also works extremely well, and yields amazing results. This pumpkin bread was a huge hit with my family and friends. Everyone was eager to test taste it as the wonderful smells filled our home. The flavor and textures were exactly what we expected in a good pumpkin bread and the loaf stayed moist for days. Some of us ate it plain while others dressed it up with dairy-free butter and honey – divine. After the butter and honey taste test, we moved into more of a savory path and spread some almond butter on it, followed shortly by sunflower seed butter. I’m happy to report it was wonderful plain and delicious with spreads. Can I make gluten-free vegan pumpkin bread? While I haven’t tested this recipe with egg substitutes to make it vegan, it is dairy-free. If you need egg free or vegan Beaming Baker has an incredible Gluten-Free Vegan Pumpkin Bread. I will test this gluten-free pumpkin bread recipe with flax egg and when I do I’ll come back and update this post. Pumpkin is such a wonderful squash. It has tons of health benefits and makes almost anything taste better. I love adding pumpkin to my baked goods and smoothies and will sneak it into other dishes when no one is looking. One of the many things I love about this particular pumpkin bread is that it is light, moist (but not wet), and not too sugary. Some quick breads leave a sugar-film in your mouth, but not this one. What nuts go well with gluten-free pumpkin bread? This recipe doesn’t call for nuts but I LOVE adding pumpkin seeds to the top, or the occasional 1/2 cup of chopped pecans or walnuts. The mild flavors of each of these nuts add a delicious touch without taking away from the pumpkin. Are you a big fan of pumpkin baked goods? If so, you will most likely enjoy my Gluten-Free Pumpkin Spiced Corn Bread, Gluten-Free Pumpkin Pancakes, and Gluten-Free Pumpkin Pecan Crumb Cake. 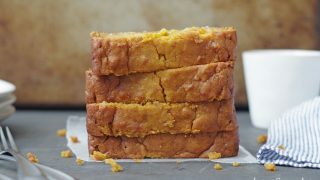 If you are a banana bread lover like me, you won’t want to miss this Gluten Free Pumpkin Banana Bread from What the Fork Food blog. Demeter from Beaming Baker has a recipe for Gluten Free Maple Pecan Pumpkin Muffins that bring all the flavors of fall together. Also, this Healthy Sweet Potato bread is another great fall quick bread option. Place the pumpkin, eggs, oil, and almond milk in a large mixing bowl. Using a hand mixer, blend until creamy. In a medium mixing bowl, mix the flour, oats, sugar, baking soda, cinnamon and pumpkin pie spice. Add the dry ingredients into the wet, and mix thoroughly until smooth. Pour the batter into your prepared loaf pan. If desired sprinkle the top with rolled oats. Bake for 50 to 60 minutes or until a toothpick inserted comes out dry and center is set. Allow to cool in the pan before removing to a wire rack. Slice when completely cooled. This looks so good! I wish I had a slice of it this morning with breakfast! I love all things pumpkin! I’ve never tried oats in pumpkin bread, that’s an interesting idea! Love how simple all your recipes are. Oats don’t agree with me, do you have a substitute suggestion? Sorry for the late reply, we are out of town on vacation. You could leave the oats out in out in a couple more tablespoons of flour. The texture will be a little different, but still enjoyable. I made my first ever pumpkin bread this weekend! WINNER! And you fell in love right? We love pumpkin bread. This sounds easy and delish! Yum! I’m so glad it is pumpkin season! I just shared a new pumpkin bread recipe 🙂 this one looks mighty tasty too! never too much pumpkin! 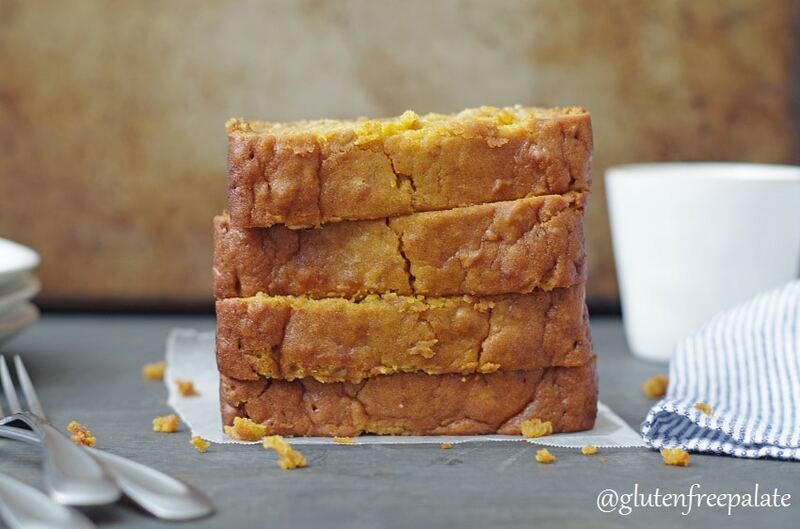 I love, love, love pumpkin bread – this one looks great! This looks amazing!! Bet it would make awesome French Toast too. Can’t to give it a try. When I first clicked on this recipe it said 2 3/4 cup Flour then when I went into the detailed instructions of the recipe it said 1 1/4 cup flour. Which is correct? Thanks. It’s 1 1/4. Where did you click on it from? I don’t see 2 3/4 anywhere in the recipe but i’d like to trouble shoot that so no one else is confused. I had a question about the flour to use….I recently bought Bob’s Red Mill which contains no xantham gum….I’m not sure if I should get some in order to make this recipe? Your flour that you suggest says it contains no gums so I’m assuming no xantham? I’m completely new to all of this and I’m trying to see if going GF will help my IBS issues….but I love pumpkin so much!!! Most of my recipes don’t call for xantham . You don’t need it in this recipe. I only use it in recipes that have a higher fat content to help the other ingredients bind together. Yes, you can use regular whole milk. My house smells divine as this bakes. My daughter was diagnosed with Celiac this spring, so I am learning to bake all over again. Can’t wait to slice into it! I haven’t made an egg free version of this recipe yet. Sorry! This is just fabulous! I made it with coconut oil and King Arthur Gluten Free Flour. My new favorite pumpkin bread. I’m so glad you liked it. Thank you for stopping back by and letting me know.